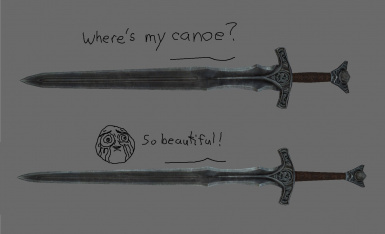 Tired of broad, thick weapons that would be far too heavy, blunt or unwieldy in actual combat? Maybe you find their styles a little too unconventional or just plain ugly? 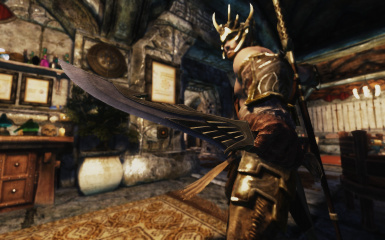 This simple weapon MESH RESHAPING mod is fully compatible with most weapon mods and re-textures. - you're not charging money for the mod! 747823 for the original WotTE scimitar mesh which I've modified. CaBaL120 for letting me use his textures, which I've modified. 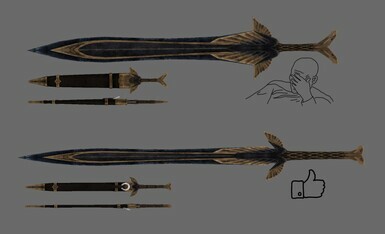 palistov for spinning arrow mesh. Girl with massive weapon art by M Rakhmatullin. + redid all refraction meshes (glass, stalhrim, keening) to match skysan's refraction mods - refraction works in 1stPerson and inventory now. To use with skysan's mods, just overwrite his meshes. Don't use the "for transparency" option, it's not updated and AFAIK there are no SE transparency mods. + added the Mehrune's altar mesh (when all the pieces fly together and form the razor). + added the inventory bound weapon mesh (the flaming crossed sword and axe you see in the spell menu), not that the difference is terribly visible. + Re-ran all meshes through the latest version of SSE NIF Optimizer, again. + Spinning dragonbone arrows seem to work fine now, so re-added. + Fixed missing EnvMap on Gemling Dragonbling greatsword ruby gems. 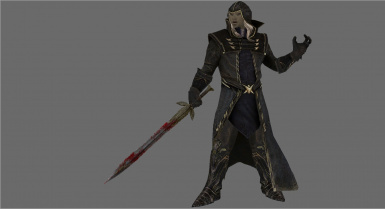 + 2-handed Dawnbreaker should now appear for people who have already cleared Forelhost. + Re-ran all meshes through the just-released latest version of SSE NIF Optimizer. + Updated all meshes to the new SSE optimized nif format using ousnius's excellent tool. 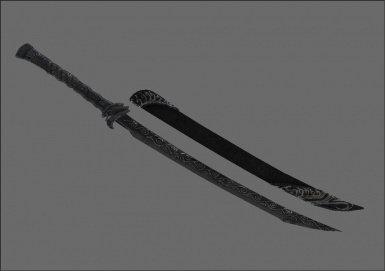 - I popped into qasmoke to check several random weapons and everything looked ok with the new format. + Updated the 2H Dawnbreaker optional to the new nif format. + Added the standalone Dragonbling optional now that Gemling Queen Jewellery has been ported, also converted to the new nif format. 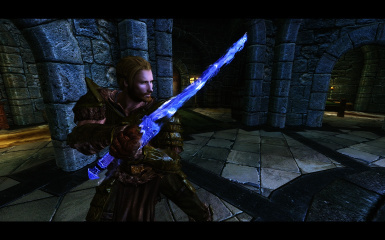 + Updated all refraction meshes: glass + stalhrim + Chillrend + Keening. I made the texture mesh smaller than the refraction mesh else this caused flickering in SSE. - Note that refraction doesn't work in first person or inventory view! 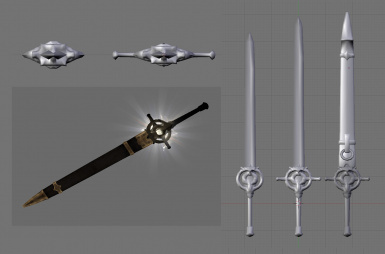 + Smoothed the glass sword guard. 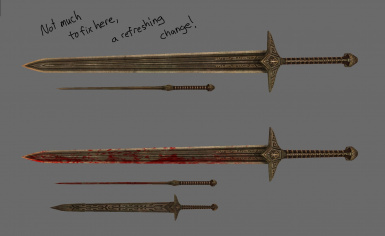 + Minor seam offset fix on the stalhrim battlaxe. + Replaced dragonbone in-flight arrow with non-spinning version until a fix for the animation is found. 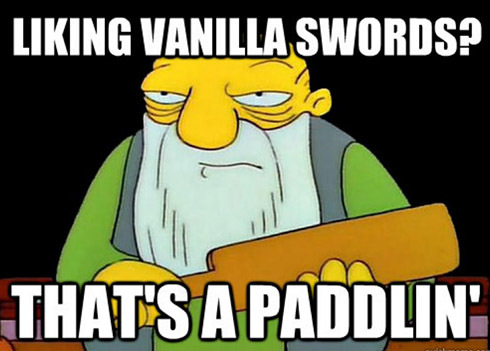 Take the paddlin' outta battlin'! 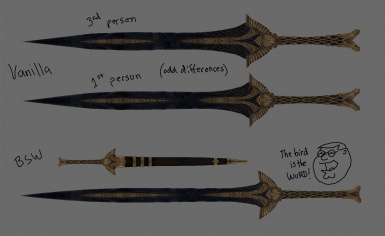 If you go to The Elder Scrolls wiki and look at any previous game's swords, you'll see they were more realistically shaped. 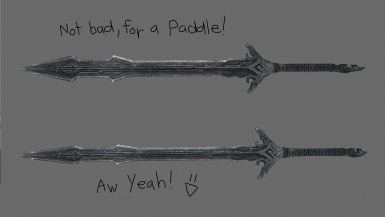 For some reason Bethesda decided to go with WoW-style foam paddles for Skyrim. 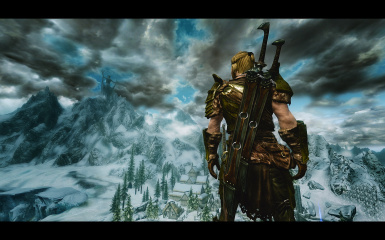 By this mod's immediate popularity, that decision did NOT sit well with many of us. 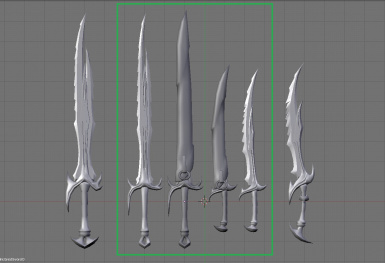 This is basically the vanilla weapon meshes made to look less.. cartoony? 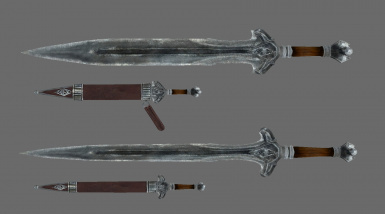 Slimmer, more realistic looking weapons - still not real, but more reasonable without distorting the textures too much. 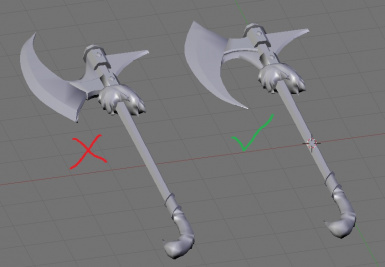 The weapon meshes have been painstakingly reshaped and fixed, NOT simply thinned/flattened uniformly. 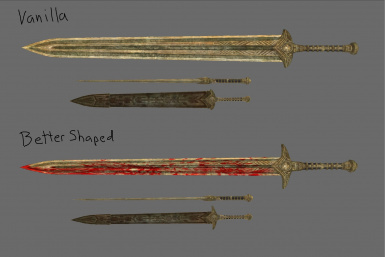 The meshes WILL WORK WITH MOST RE-TEXTURES (weapon or blood), see "Compatibility" below (and ignore textures seen in the images). 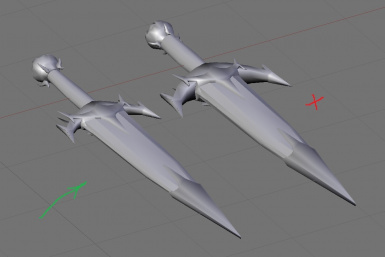 The blood meshes have been reshaped together with the blades - and many fixes were made while I was at it! Obviously these meshes will affect ALL weapons, not just the player's. The meshes have not been made denser (occasionally a few polys are added to smooth a curve or ease a texture distortion), although the same 1stPerson meshes have been used for the (usually less detailed) NPC meshes (half the work) but this has a negligible effect on framerate. Don't take the images too seriously, I made them as a joke at first release (2013), never expecting this mod's popularity. Most are outdated and don't really do the weapons justice. See the user images for a better impression. This is a replacer for the vanilla meshes, with no plugin (esp). It can be installed or uninstalled at any time, with no effect on your saves. Use the installer through your mod manager, everything is optional. 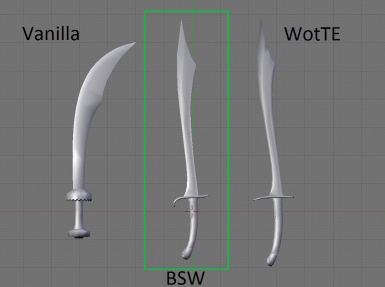 000 BSW Textures: Contains matching sheath textures for some swords + the new Scimitar textures. 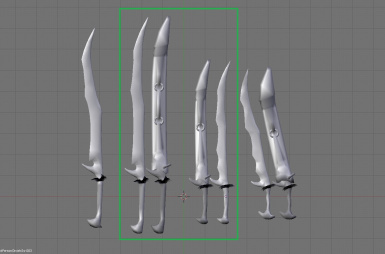 0## Folders: Main weapons: Sword, axe and dagger meshes, also contains any related loadscreens for those weapons. 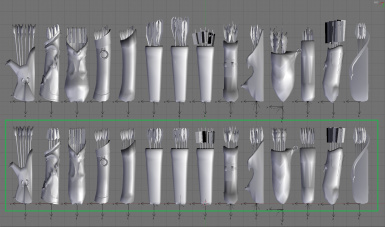 1## DSR Folders: Left sheath meshes for the Dual Sheath Redux/Ecotone Dual Sheath mod - overwrite the meshes. 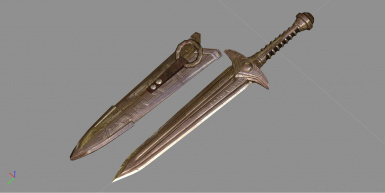 2## NGS Folders: Greatsword meshes without sheaths (vanilla style) - overwrite the GS meshes from 0## Folders. 3## Arrow Folders: Quiver meshes - doesn't include in-flight arrows so you can use spinning arrow mods. If you don't know how to install/uninstall manually then you probably shouldn't be doing it! 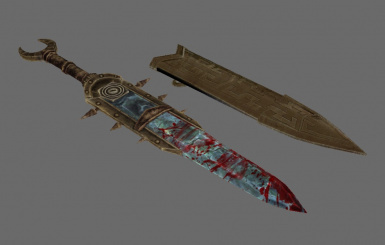 Dual Sheath Mods: Left-hand sheath meshes - requires DSR/Ecotone Dual Sheath﻿ - overwrite it's meshes. 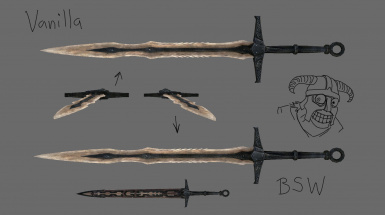 NO Greatsword scabbards: for those who DON'T want greatsword sheaths (vanilla-style). 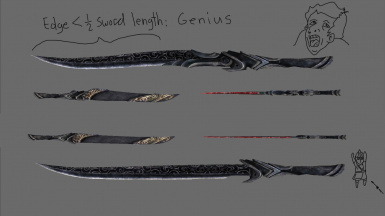 aMidianBorn Skyforge weapons: requires aMB Skyforge mod - overwrite it's meshes. 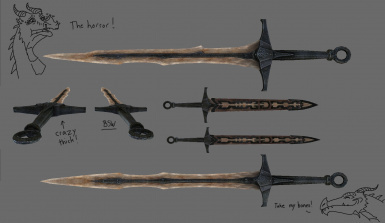 Runed Nord Hero Weapons: requires RNHW mod - overwrite it's meshes. 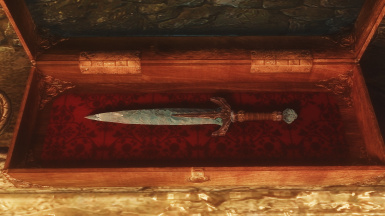 Ultra HD Silver Sword: requires UHSS mod - overwrite it's meshes. 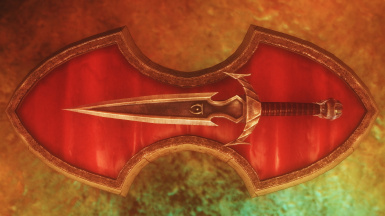 Dawnbreaker: choice of either Elven or Dwarven sheath versions, + separate optional (esp) 2-handed version. 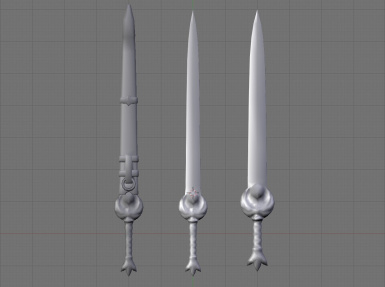 DragonBling weapons: adds ruby, emerald or sapphire pommel stones to the Dragonbone meshes (DG only). 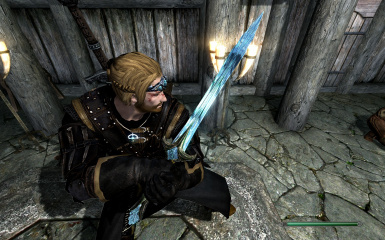 DragonBling Gemling All Standalone: separate optional file - requires Dawnguard and Gemling Queen Jewelry's textures. 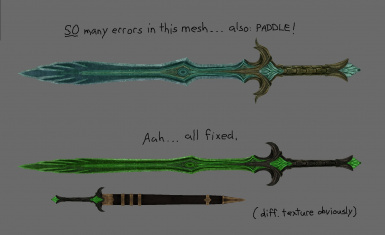 Adds high-quality translucent Ruby, Sapphire & Emerald Dragonbone weapons to the crafting menus (esp). 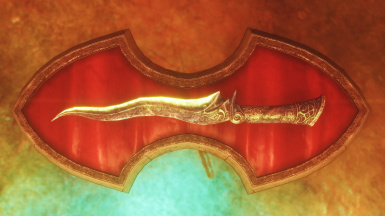 Doesn't touch DG's Dragonbone weapons, so you'll have 4 different types of Dragonbone weapons in-game (you still need my main file to change the vanilla DG weapons). Optional DSR & NGS meshes included. 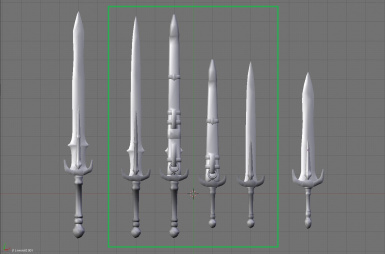 Only adds the weapons I've edited so far: sword, greatsword, dagger, battleaxe and quiver. Requires Dragonbone crafting and flawless gems, same stats but greater value based on gems. Refracting Glass/Stalhrim(DB)/Keening: Refraction makes glassy parts look glossy and reflective. 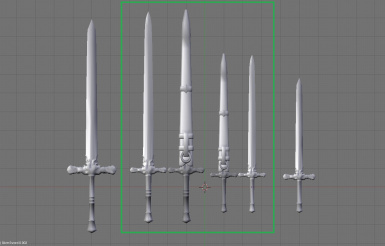 These can be used as-is for glossy opaque weapons (looks cool) or together with skysan4298's mods (glass﻿﻿|stalhrim﻿) for transparency (overwrite his meshes). 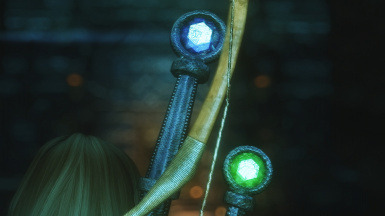 There are two refraction options are: 'Opaque' (refraction+blood), and 'For transparency' (refraction+transparent); Skyrim can't show all 3 (refraction+transparent+blood). 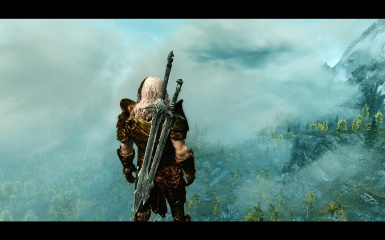 Note: Skyrim's engine causes parts of the refraction to disappear when held up before particle effects like smoke. Parts of the blood may also disappear based on viewing angle due to the refraction. SkyRealism - Shiny patch: separate optional file - requires SR-S - overwrite it's meshes. 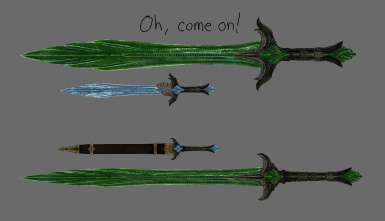 Makes armour and weapons reflective like real polished metal, but not compatible with other retextures like aMidianBorn. Note: some of his textures lack mipmaps, causing a slight lag when viewing them, this causes some loadingscreen items with alot of his textures applied (like the nord in full metal plate or the guy in full dwarven gear) to only partially load. Similar to refraction, the reflection can't really be appreciated in screenshots, but if you actually play the game it does look very pretty. Compatible with everything except other MESH-replacing mods. If a re-texture mod includes meshes, then the new textures will usually still be used, unless the author changed the texture filenames/paths; otherwise they just changed some shader properties, so you get the new textures, but without the shader changes. When meshes are included, a patch is required to get the full effect of the retexture mod. I've made a few patches, and will make more for popular enough re-textures, but I obviously prefer when they make the patches themselves (saves me having to investigate exactly what changes they made to the meshes, which can be tedious), and adding yet more options to my installer is a pain. 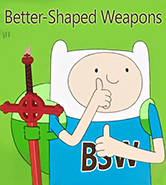 replacer mods that change weapons with completely new, uniquely-shaped meshes require no patch; just install that mod after this one to use their meshes. 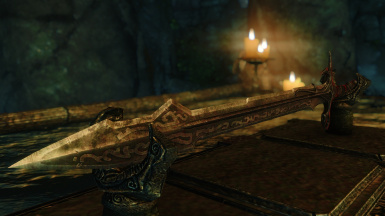 Mods that make the game's "unique" weapons actually unique-looking are compatible as they must use a plugin to assign new unique meshes to the weapons. 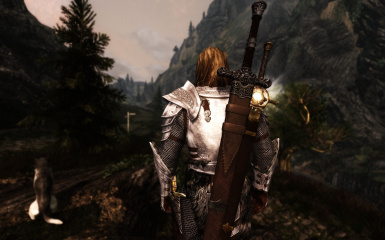 Fully compatible with mods that only change weapon stats, enchants, effects, etc. using a plugin. 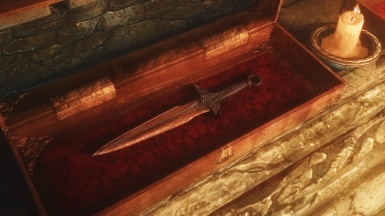 Swords, Daggers and Greatswords that didn't have proper scabbards have been given them (except Ancient Nordic, see FAQ), only the Greatsword sheaths are optional. 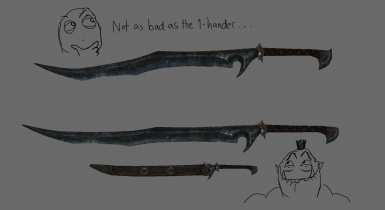 Don't like a particular sheath? Easily deleted in Nifskope (open, click on Scb, CTRL+DEL, save). 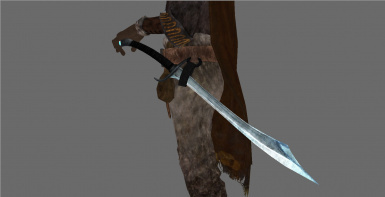 Re-coloured scabbard textures were made using vanilla or aMidianBorn BoS textures (with permission). you can PM me to let me know, but you don't have to. 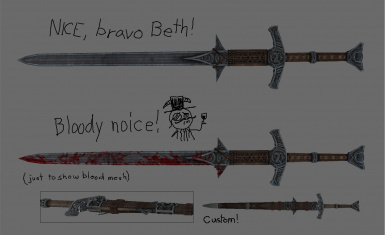 Having both sword AND greatsword on the back was achieved by a custom edited skeleton.nif and the GearedUp ini tweak. 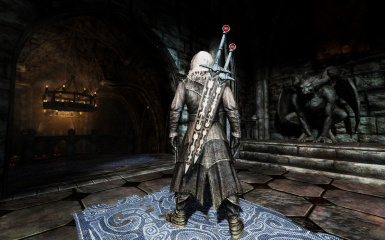 The skeleton.nif file tells Skyrim where sheathed weapons hang on the body. 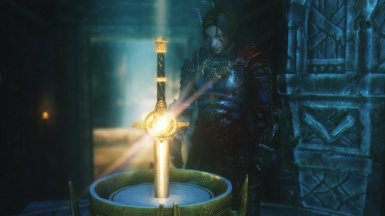 There are several available as mods here or you can adjust the nodes yourself in Nifskope (it involves finding the proper weapon node and moving/rotating it until happy). 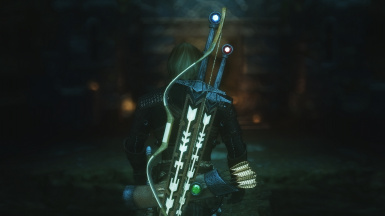 Remember that if you move the sword node up beside the 2-hander like I did then you'll also need new sheathing animations for the new position - these are also available in several mods. 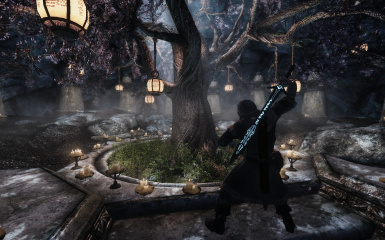 The ini tweak lets you see your Favourited dagger, sword, mace, axe, bow and 2-handed back weapon all simultaneously, and it will work for ANY Favourited weapon (mod/dlc/etc) without having to use any complicated mods. 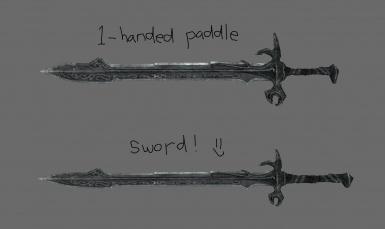 Unfortunately it requires that you get used to sheathing your current weapon before drawing another or casting with that hand (which is just realistic imo). Forgetting to do this will cause visual weapon anomalies which can be fixed by un-Faving the weapon. This is an awesome feature that was never finished and so it's disabled by default; to enable it you simply put bDisableGearedUp=0 under [General] in your Skyrim.ini (in Your Documents). You can also now move your sheathed weapons around using RaceMenu or ECE. 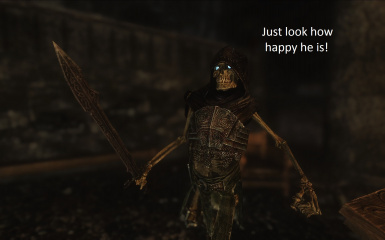 No I won't release my custom skeleton, it's tweaked to my personal preference together with animations from several mods, so please don't ask. I take no responsibility for you messing up your game with this information, I put it here because many have asked about it. If you don't know what you're doing and mess with your game it's all on you. I encourage searching the net and experimenting (it's how I learned everything) but at your own risk.